Maintaining a lawn can be a hideous task for some people as natural lawns require high maintenance regularly. That’s why a lot of people are turning to artificial grass lawns as a solution. 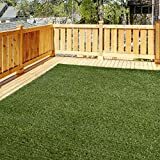 Whether it for the patio, deck, or pool area, artificial grass carpets provide a convenient and long lasting solution that saves a lot of energy and money in regards to maintenance and care. Furthermore, their use has been proven to impact positively on the environment reducing water consumption and chemical usage. No watering – Natural lawns will normally require regular watering daily in the morning and in the evening. However, with artificial lawns you don’t need to water them ever unless it is for cleaning purposes which happens occasionally. As such your water consumption will dramatically reduce, which is not only good for your pocket but the environment too. Safe for Pets and Kids – Artificial lawns are made from non-toxic materials. They also do not require fertilizers, weed killers, pesticides and other chemicals. They are therefore much safer for kids and pets than natural grass a reason why most people and even cities prefer them over natural grass. Low maintenance – Apart from not requiring fertilizers and pesticides, artificial lawns do not require to be mowed or watered either. You will only need to carry out regular cleaning whenever there is need to. They are durable – Artificial lawns have been constructed with the highest quality synthetic materials that are UV stabilized, fade-free, resilient and highly durable. They can withstand harsh weather conditions all year round but still look great as ever. Their ability to be used in any weather condition also makes them stand out and be preferable over natural lawns. No more weeds – One of the biggest problems with natural lawns is dealing with weeds. It takes a lot of energy and money to keep those under control. However, with artificial lawns that may be a thing of the past. Yes, you may need to pull them once in a while, but they are less prevalent than with natural lawns. Cost – Artificial lawns are expensive to install. You will need to prepare the ground, materials and drainage which require a substantial amount of money. And since they cost per length, if you have a large yard you may end up spending quite a fortune to have them installed. Temperature –Unlike natural grass, artificial lawns do not have a cooling effect when air temperature is high. This grass absorbs heat and may become even hotter than the surrounding air making them uncomfortable. Overall, artificial grass presents many advantages over natural grass lawns. However, before you make a purchase decision, there are several factors you need to consider when choosing an artificial grass lawn that will serve your needs best. Artificial grass is all about how it feels. Hold it, brush it against your legs and arms and know how it feels. A soft, lush feeling is what you should be looking for in artificial grass. You want your kids and pets to be comfortable playing on the grass so this is a major factor you should look out for. You should take a look at the backing for drainage holes; count and frequency. If you live in an area where rain is frequent, you should go for a rug with plenty of drainage holes so that it doesn’t feel soggy whenever it rains. This also should apply if you plan to you use your artificial grass rug in the pool area where it will be in contact with water frequently. Your artificial grass lawn should look slightly different in the morning, afternoon and evening just like natural grass if it is of the highest quality. Put a sample of the grass outside and observe the color variations during these times of the day before settling on the right one. Some artificial grass rugs will require that you add some material such as sand on the top while others don’t. For those that require you should keep in mind that these will be part of your maintenance costs as you will have to replace the in-fill material at some point. If you have pets, shorter grass blades will be easier to clean and maintain. Although long grass blades may look and feel lush and lovely, cleaning them is a little bit tricky. Moreover, short blade heights will give your lawn a well-manicured look and is therefore more preferable than longer grass. Most artificial grass rugs have a guarantee of between 5 to 15 years. This is one factor you should look for before investing in one. If you are looking for a grass lawn to serve you long term, then go for one with a long-term guarantee. When choosing an artificial grass lawn, there are other costs you need to consider apart from the price of the grass rug. These include preparation costs, grass removal and drainage systems. You should also consider maintenance costs that come with the grass rug you are choosing for your home. The density of a grass lawn is measured as the amount of yarn per square unit of the lawn. Denser lawns have more yarn and are therefore of a higher quality and more expensive. They are also aesthetically more appealing, more durable and will generally not require in-fill when being installed. The best artificial grass lawns come in different shades of green while the cheap ones are flatly green. However, before buying one, you should take a sample of the rug home and see which one will complement your house and décor. Using the above factors, we came up with the top 10 best artificial grass for indoor and outdoor use for 2018 that will offer service and value for money and will be beautiful and look incredible on your lawn. Have a look! 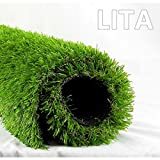 Made from high quality synthetic materials, this grass patch is heavier than other alternatives and is extra-lush with a soft feel under bare feet. It is toxin-free and is safe for your pets and kids. Moreover, the glass blades give this patch a lovely manicured look which will make your lawn stand out. It is UV resistant, fade-resistant, highly durable, and stain-resistant and can withstand harsh weather conditions without degrading. Besides, this grass patch is low maintenance so you don’t need to mow, spray, and apply fertilizer or pesticides. It is also easy to clean and installs easily with a rubber backing to keep it in place. Its Edges are bound with a premium fabric giving it a finished look and which also helps prevent fraying. This rug is a perfect way to add color and excitement to your pool, patio or deck and is guaranteed to last for several years. 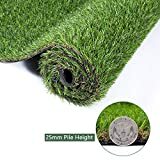 Made from high quality materials, this 15′ artificial grass patch is super resilient, durable and highly dense and is guaranteed to last over 5 years. The materials used in its construction are eco-friendly, non-toxic and give it a lush, soft and thatch look making it perfect for outdoor and indoor projects. Besides, its 1 3/8-inch blade height gives this grass patch a well manicured look all year round. It also installs and cleans easily and is mould-proof ensuring you enjoy a green lush look. Furthermore, this grass patch is low maintenance and therefore you won’t have to spray, fertilize, water or mow your lawn. It also has drainage holes with a PU backing which allow for water drainage when cleaning or during rains or snow. This grass patch can withstand extremely cold and hot weather conditions and still maintain a green natural look. 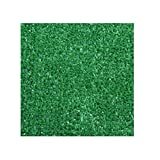 This artificial grass patch is made from high quality materials and is super resilient, durable and highly dense and is guaranteed to last over 14 years. The materials used in its construction are eco-friendly, non-toxic and give it a lush, soft and thatch look making it perfect for outdoor and indoor projects. Besides, its 1 3/8-inch blade height gives this grass patch a well manicured look all year round. It also installs and cleans easily and is mould-proof ensuring you enjoy a green lush look. Furthermore, this grass patch is low maintenance and therefore you won’t have to spray, fertilize, water or mow your lawn. And since it is highly resilient, this grass patch can withstand extremely cold and hot weather conditions and has drainage holes for use in rain or snow. Constructed from high quality synthetic materials, this grass rug is durable, fade-resistant, fire-resistant, stain-resistant and UV stabilized making it an ideal choice for high temperature or extreme weather areas. It has drainage holes in rubber back and can therefore be used in during snow or rain weather. The drainage holes also aid in cleaning as they provide a passage for hosed water. Furthermore, this rug is easy to install and can be cut down to size without fraying. Besides, it is low maintenance and does not require spraying, mowing, watering or application of fertilizer. Its 1.2-inch grass blades give this rug a perfectly manicured look with a lush, soft and thatch look just like natural grass. As such, this rug is ideal for use in patios, pools, balcony, and terrace and for decoration among many other applications. This outdoor turf rug is made of lightweight synthetic materials and features a low blade height with marine backing. It installs easily with a simple unfold and lay-down and can as well be folded up easily without fraying. Moreover, this rug can be simply staked into the ground. Its edges are bound and finished all-round which prevents fraying making this rug ideal for use on decks, camping, boats and pool areas. Besides, it is UV stabilized and fade resistant and can therefore withstand harsh weather conditions all year round. This rug is easy to clean, light weight and low maintenance giving you years of green enjoyment. 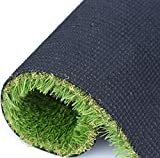 Made from high quality materials, this artificial grass patch is super resilient, durable and highly dense and is guaranteed to last over 14 years. The materials used in its construction are eco-friendly, non-toxic and give it a lush, soft and thatch look making it perfect for outdoor and indoor projects. Besides, its 1 3/8-inch blade height gives this grass patch a well-manicured look all year round. It also installs and cleans easily and is mould-proof ensuring you enjoy a green lush look. Furthermore, this grass patch is low maintenance and therefore you won’t have to spray, fertilize, water or mow your lawn. And since it is highly resilient, this grass patch can withstand extremely cold and hot weather conditions and still maintain its pristine look. 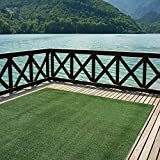 Made from high quality synthetic materials, this grass patch is 50% heavier than other alternatives and is extra-lush with a soft feel under bare feet. It is toxin-free and is 100% safe for your pets and kids. Moreover, the 1.7-inch glass blades give this patch a lovely manicured look which will make your lawn stand out. It is UV resistant, fade-resistant, highly durable, and stain-resistant and can withstand harsh weather conditions without degrading. Besides, this grass patch is low maintenance so you don’t need to mow, spray, and apply fertilizer or pesticides. It is also easy to clean and installs easily with a rubber backing to keep it in place. Measuring 3′ x 5′ with a blade height of 1 ½ inch blade height, this Golden moon artificial rug is ideal for indoor and outdoor decoration. It is manufactured from the highest quality synthetic materials which are fire-resistant, durable, fade-resistant and UV stabilized. As such, this rug can withstand years of extreme cold and hot weather and still maintain a perfect green look in your lawn. Moreover, this rug is low maintenance and does not need to be mowed, sprayed or watered. It is also mould-proof and installs and cleans easily. This synthetic grass carpet is made from high quality material that look and feel like natural grass. It has a blade height of 1.25 inches which gives it a well-manicured look. Moreover, this carpet is stain resistant and is UV stabilized making it highly durable and fade resistant. Its finished bound edges also prevent any fraying and ensure you maintains a perfect natural look. This carpet is easy to install and can be cut down to size without any fraying. It also has drainage holes all round that help drain water when cleaning or when it is rained on. It is easy to clean and this carpet will give your lawn a natural green look for several years. Made from high quality synthetic materials, this lawn turf carpet is super resilient and highly durable. The polyethylene and poly polypropylene yarns used in its construction are highly UV resistant which also prevents its degradation when in the sun. 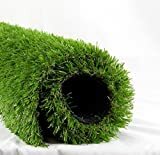 Moreover, this artificial grass lawn carpet is environment friendly and non-toxic with a lush, soft and thatch look which provides you with a green grass look all year round. Additionally, this carpet is low maintenance requiring no watering, spraying and mowing. This carpet features a blade height of 1 3/8 inches which will give your lawn a perfect manicured look. It is also easy to install and clean and is guaranteed to last over 10 years. For your artificial grass lawn or patio to maintain a natural and beautiful look, you should care for it on a regular basis. Care and maintenance not only makes your lawn stand out from your neighbors’, it also ensures your artificial grass lawn will last longer. Below are a few tips on how to care for and maintain your artificial grass lawn. Depending on the amount of traffic your grass lawn gets, you should brush the grass regularly to keep it in the best condition possible. Brushing keeps the grass fibers upright for longer maintaining a beautiful and natural look on your lawn. Leaves and organic debris should be removed promptly from your lawn. If left for long, they will decompose and form compost which will not only deteriorate the look of your lawn but also encourage the growth of weeds. You can use a normal leaf blower to clean your lawn or even pick them by hand if that is feasible. If you use heavy items such as flower pots or inflatable swimming pools on your lawn, they will make the grass fibers to flatten. Therefore, it is important that once such items have been removed, you use a broom with firm bristles to brush the fibers up again so that your lawn is restored to its original natural look. Although most artificial grass rugs can withstand winter conditions, if an icy layer forms on the grass as a result of snow, it should be left to melt naturally. This is because trying to remove the ice manually will fray and damage the fibers. Extreme care should be taken to ensure fire and other hot items do not come in contact with the artificial grass lawns. They have the potential of melting the grass which can be expensive to repair and also leave a noticeable difference in your lawn. Although weeds are not as prevalent as in natural lawns, they sometimes grow in artificial grass lawns. These however can be easily removed using a rake, brushing or manually picking them up. Because they are not that prevalent, it is advisable to avoid using chemical herbicides on your lawn as much as possible. Although these top 10 best artificial grass carpets for indoor and outdoor use require high initial investments, they deliver value and offset the costs in the long run. Most of them can be used for more than 10 years! Imagine the amount of money you are going to spend watering, applying fertilizer, spraying and mowing your natural lawns? You can save a huge chunk of that with these artificial grass rugs. Moreover, there are places such as your pool area where natural grass just can’t do it. Besides, when you choose to use these artificial rugs, you will be contributing in making the environment clean and green by reducing usage of pesticides and herbicides. These rugs will also add décor, color and fun to your pool area giving you a lush, soft free. They are also mould-free and safe for your pets and kids all you have to do is just relax and enjoy.